Still looking for that perfect Easter meal? 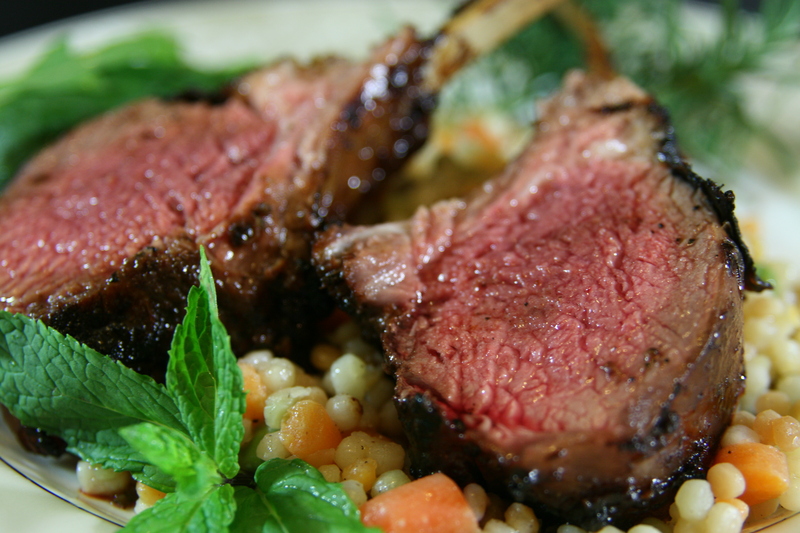 This springtime infused rack of lamb is great for any holiday; or any day. 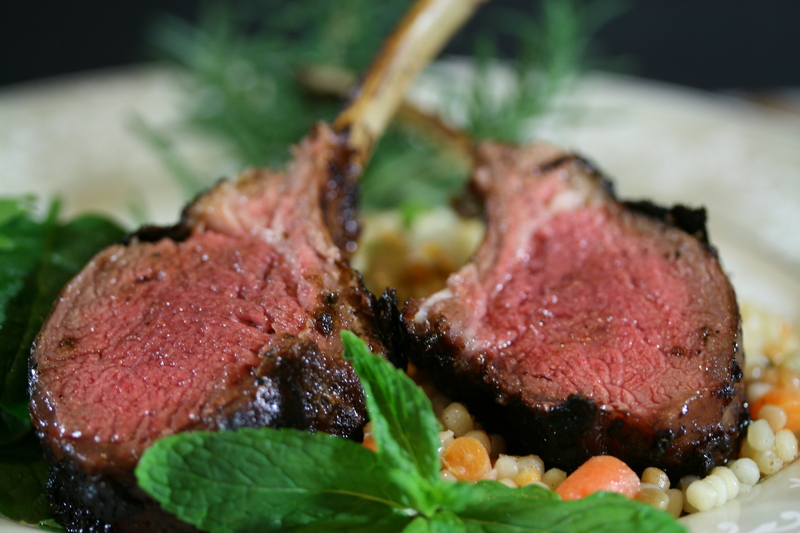 We glaze the lamb with a lovely mix of springtime flavors like cherries and fresh herbs. 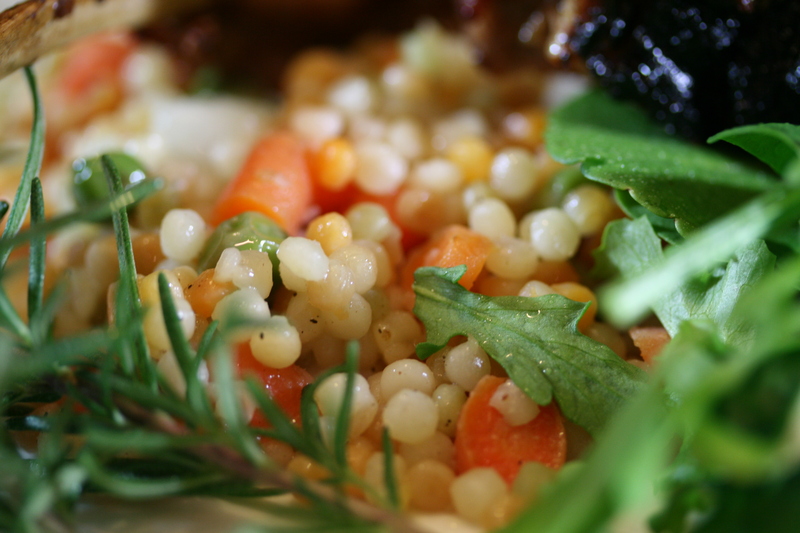 The lamb rests on a bed of tender couscous and springtime vegetables like peas. If using dried cherries, let them sit in the liquid for an hour before preparation. Heat the butter in a medium saucepan and melt over medium heat. Add the shallot and soften, 2-3 minutes. Add the rest of the ingredients and simmer for fifteen minutes, the liquid should reduce by ¼ to 1/3. Remove the rosemary and cinnamon. Using an immersion blender or in small batches in a blender or food processor puree the mixture. It will resemble a thin paste. Remove and coat the lamb. Grill the lamb until done, allow to rest, slice and serve. In a medium sauté pan heat 1 Tbs olive oil. Add the couscous and lightly toast, stirring frequently about 3 minutes. While the couscous is toasting, bring the stock to a boil. Remove the couscous and place in a large bowl, add the stock and cover for 8-10 minutes. While the couscous is finishing, heat the remaining 1 Tbs of olive oil and add the onions and cook for 2-3 minutes. Add the carrots, cook for another minute and then add the peas and cook for another 1-2 minutes. Remove and add to the couscous mixture. Add chopped mint and mix well. Season as needed with salt and pepper. A dish fit for kings! and lions! delightful meals love lamb going to Australia and New Zealand this month will have to get me some !! No lamb-like weather here, yet, as it snowed all day today. Will keep this on the back burner until later in the month. 😀 The couscous looks awesome. Thanks for an idea to dress up the side! He he my husband used to tell me I was his ‘Perfect Spring Rack’ when we first got married…oops did I go there! We love love love this type of food, now I have to convince him its time for possibly a whole rack, Easter would be a good reason, thanks doc!